It is what both I and Eddie Izzard might call a glorious day. Quarter to one comes the call to shuffle up and deal. No, wrong activity. To saddle up and wheel. Solo Shimano approaching 40mph down the Red Lion hill before the Romanesque rise & fall of Sandy Lane. Quick wave to Roy Keane's house, now on the market for a cool £3m, appaz. Behold the Bridge. Broadly facing Barretts we find The Eco Kid adorning the window of an ex shoe shop. 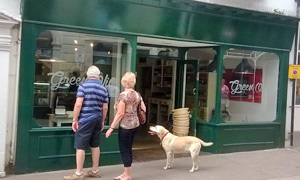 All soled out, there are some shiny new heels in town in the form of the Green Olive Deli. Those handful of tables merit its inclusion in The List. En velo, en retard, I've missed Andy's text: "Fancy a cheese and meat platter to share?" This particular fait is very much accompli. Not long before our de rigueur monster wooden board is placed before us loaded with a plethora of foody goodies. Must confess to not catching the full rundown from the nice lady serving us, but there's the eponymous green olives, chorizo, wafer biscuits, cheese, olives stuffed with feta, more chorizo, more cheese, and some succulent balsamic pickled onions. Sitting there soaking up some window rays, and what with Andy hailing from Sheffield, we're living our very own version of the O2 Boys' Four Yorkshiremen sketch. Now that, Andrew, is a highly quaffable rhubarb mocktail. We manfully work our way through these many Mark-and-Lard quality items, Andy pausing every five mins to chat to someone, inevitably female, browsing the shelves. Don't often mention this facet of the light lunch experience but the background music is not half bad, being of the Editors and Elbow 6Music variety. Gone two and we really should get back to work. Ample time, then, to order a cafetiere for two and a sneakily excellent Portuguese custard tart. The G.O.D. is a pimp for Pump Street, casting its net of sourdough ever wider. Shame to leave but mighty glad for the bike ride back to the big bad office. If it was a car -- Honda CR-Z Hybrid Coupe. If they were passing by -- Sarah Greene.